Conducting polymers were discovered in 1970s in Japan. Since this discovery, there has been a steady flow of new ideas, new understanding, new conducing polymer (organics) structures and devices with enhanced performance. Several breakthroughs have been made in the design and fabrication technology of the organic devices. Almost all properties, mechanical, electrical, and optical, are important in organics. 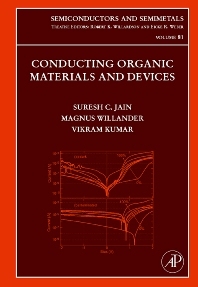 This book describes the recent advances in these organic materials and devices.